The Vestibular Disorders Association estimates that 42% of the adult population reports episodes of dizziness or vertigo to their physicians and that in 85% of those cases, vestibular dysfunction causes the patient’s problems. Left unaddressed, the occasional dizziness or disequilibrium can lead to injury falls, auto accidents, work accidents, or fear of performing normal activities of daily living. 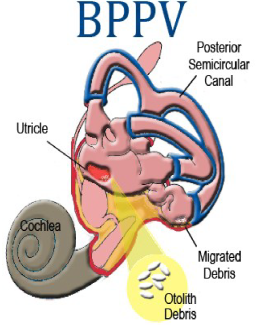 Benign Paroxysmal Positional Vertigo (BPPV) has been described as the most prevalent form of vertigo, with incidence rates estimated as high as 50% in the age 70+ population. Impressive Results: Numerous trials demonstrate the efficacy of physical therapy approaches for BPPV. Noteworthy among these for the large number of patients treated and the length of follow-up is a study slated for publication in Audiology and Neurotology in 2013. Researchers followed 965 patients with confirmed BPPV (posterior, anterior, and/or horizontal canal) for up to 74 months. Symptom duration ranged from one-day to eighteen months. Eighty-five percent of cases resolved with one treatment, and 98% of cases resolved with two or three treatments. Over the course of more than six years, recurrence was only 14% , with elderly patients and patients with head trauma leading that average. The head re-positioning techniques work to mobilize debris in the posterior canal so that it can return to the utricle and dissolve. Vertebral compression of the artery contraindicates some maneuvers in vestibular rehabilitation. Complications from the BPPV repositioning maneuvers include horizontal canal migration and canalith jam. Additional repositioning maneuvers can correct both of these complications.